Thread: This is why you measure paint! This is a 2018 Mazda. I’ll have more later but this is why a responsible detail shop will measure paint thickness! Some people will go after this with a rotary and wool pad! Re: This is why you measure paint! This is just terrible news on a new 2018 Mazda !!! Glad you are always on top of it, Mike ! For those not familiar, that’s thinner than a post it note! Thank you! That is crazy thin! Curious Mike why you chose Mills instead of microns? I know their have been many threads on the topic but I`m still curious. Just always trained that way, just never switched? Wow, what model Mazda is that? that is super thin!! Are they cutting back on clear coat, paint, or both on the new cars to save a few bucks? When I got my car painted I picked out the type of clear and had them put 3 coats on. Looked great, but wow a ton of orange peel that had to be sanded. I see Mazda hasn`t changed this for the better; that`s even a tiny bit thinner than our last one was. Mike lambert- Thanks for posting this! Very timely too, as we`ve been discussing wetsanding/orange peel on a few threads lately. Eh, forget wetsanding, that`s not thick enough for much correction period so I hope it doesn`t get marred up. You planning to coat it with Modesta? I wouldn’t attempt to remove any texture on a newer car! Despite what others are doing. That greatly diminishes the life of the paint. Yes it will get Modesta, that is all we offer now. Thank you! Thanks for sharing. It`s nuts that this new car paint is so thin! Curious Mike why you chose Mills instead of microns? I know their have been many threads on the topic but I`m still curious. When I started using a PTG, and when I first learned about it, the measurements were in Mils. After playing with it a bit, and trying out the different settings, I switched and continue to use microns. Why? Here are some readings I just took from my hood: 118, 115, 112. Say this was a 2 step correction, I would have started with 118 microns, then 115 after the 1st step, and finally ended up at 112 microns. Those same readings (using the conversion) in mils are: 4.6456, 4.5276, and 4.4094. Now I`m looking at decimal points, or tenths/hundredths of a number! I don`t want to be trying to calculate numbers in my head while working on a panel. 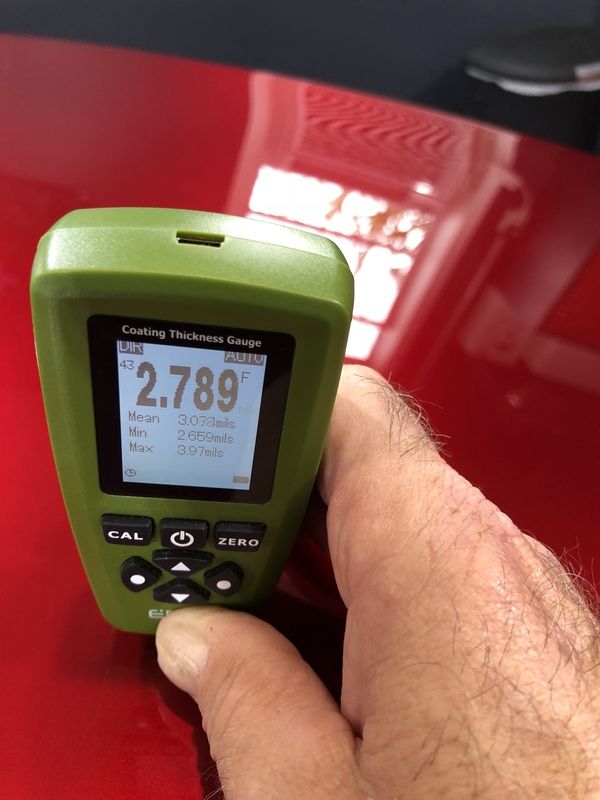 I will ask the inevitable question for those of us uneducated on today`s automotive paint production methods; What IS an "acceptable" paint thickness for a new car?? I like your thought process about whole numbers using microns. I makes sense as long as you are familiar with the unit of measurement and can relate to how much it is for what you are measuring. I don’t think you can answer that question? I think the question needs to be nowadays is what is now the acceptable amount of paint you can remove over the life of the car, and still keep the integrity? Agree. It`s not like most people care how much paint there is or how much correction it can stand. And with it being *SO* easy to cut off a lot of clear in moments these days, it could be a recipe for disaster long-term. But few people really think of vehicles as long-term investments any more, so I doubt many will really care about that either. For those of us who *do* care, IMO the #1 priority oughta be not marring it in the first place. Regarding the Metric System- as a kid back in the `60s I was taught both English and Metric side-by-side and expected to know both. In first grade. How does one measure the paint depth? (A bit OT) Extreme measure?